As two brothers are convicted of the manslaughter of London schoolboy Damilola Taylor, BBC News tracks the key events of the long-running case. 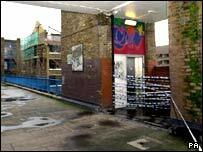 27 November: Damilola Taylor, a 10-year-old schoolboy, was found bleeding heavily on a stairwell of the North Peckham Estate, south-east London. Despite the efforts of several passers-by and an ambulance team to save him, Damilola was certified dead at King's College Hospital shortly afterwards. A trail of blood from the wound in his leg led to Blakes Road, where police believed he was attacked and stabbed with a broken bottle. 2 December: Several youths were arrested in connection with the case - including two brothers who would eventually stand trial in 2006 for Damilola's murder. All were released without charge. 14 December: The two brothers were re-arrested along with nine other youths. No charges were brought. 21 December: Hassan Jihad, who would also stand trial for Damilola's murder alongside the two brothers in 2006, was arrested and released after questioning. 19 January: Damilola's funeral took place in Plumstead, south-east London. Joining the family in mourning were football stars, government officials and hundreds of members of the public. 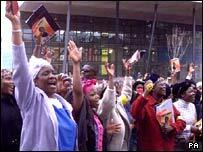 7 April: More than 500 people marched through Peckham in a tribute to Damilola organised by several churches. 26 June: Four youths - one aged 14, two 15-year-old brothers (not the same brothers who were arrested in December 2000), and another boy aged 16 - were charged with murder and assault with intent to rob. All four, who could not be named because of their ages, denied the charges. 27 November: On the first anniversary of Damilola's death, Prime Minister Tony Blair pays tribute to the boy as he opened a youth centre in Peckham, renamed in Damilola's honour. 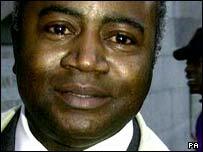 Defence barrister Courtenay Griffiths cross-examined "Bromley"
30 January: The trial of the four youths began at the Old Bailey. In his opening, prosecutor Mark Dennis said the four acted with "deliberate and controlled" violence in killing Damilola. The four denied murder and robbery. 4-12 February: The prosecution's star witness, a 14-year-old girl named as Bromley, described to the jury how she witnessed Damilola being attacked. But under cross-examination she was accused of lying and being an attention-seeker. It is revealed she ran up a £4,000 hotel bill after being put into a witness protection programme and the police are accused of offering gifts for evidence, which they denied. 27 February: In a major blow for the prosecution, the judge Mr Justice Hooper ruled witness Bromley was lying. He ordered that the 17-year-old defendant be found not guilty of all charges and released immediately. 28 March: The case collapsed against a second defendant, the 15-year-old boy, and he too walked free from court, leaving the two 16-year-old brothers as the only defendants. 25 April: The trial ended with the jury finding the two brothers not guilty of all charges. 26 April: Amid intense criticism, the Metropolitan Police and the Crown Prosecution Service each established their own inquiries into the handling of the case. Bishop John Sentamu of Birmingham undertook the police review and Director of Public Prosecutions Sir David Calvert-Smith assessed the conduct of the CPS. Detectives announced they still believed Damilola was murdered and the case was still open. 9 December: Bishop Sentamu published a 54-page report which praised the initial police investigation but criticised the way the inquiry was scaled down after the four boys were charged. The CPS report was also released and concluded that the decision to prosecute four teenagers for the murder of Damilola was "the right thing to do". Both reports agreed the case had highlighted weaknesses in the criminal justice system. 7 August: Witness Bromley told the BBC her life had been ruined by being branded a liar in court. She said she had moved home 39 times and no longer goes to school. 27 November: The police announced they would review all of the evidence in the case, using forensic techniques that were not available during the earlier inquiry. 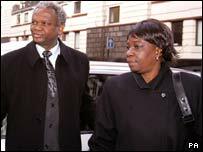 22 January: London mayor Ken Livingstone honoured Damilola's parents, Richard and Gloria. He presented them with a From Boy to Manhood award at the Peckham youth centre named after their son. 8 August 2004: Sir John Stevens, commissioner of the Metropolitan Police, announced his retirement and mentioned Damilola in his official speech. He told of his "deep regret" at not catching the boy's killers. 6 January: Three youths were charged with Damilola's murder. They were Hassan Jihad, 19, from Peckham and two brothers aged 16 and 17 who could not be named because of their ages. They all deny the killing. 20 May: The three appeared at the Old Bailey, where they formally entered not guilty pleas. 24 January: Prosecutor Victor Temple QC opened the trial of the three youths by telling the jury the initial investigation missed vital DNA clues. He said spots of Damilola's blood were found on their clothes. 7 March: An expert witness for the defence said Damilola was not stabbed, as the prosecution claimed, but fell on a shard of glass. 3 April: Hassan Jihad, now 20, was cleared by the jury of all charges in relation to Damilola's death. 4 April: The two remaining defendants were cleared of murder, but the jurors could not reach a verdict on the manslaughter charges. The Crown Prosecution Service said it would consider a retrial on those charges for the two brothers. 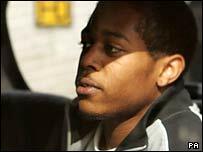 23 June: New trial began of the two brothers, who were now both over 18 and could be named as Danny and Rickie Preddie, of Peckham, south London - this time for manslaughter which they both denied. 9 August: Danny and Ricky Preddie, aged 18 and 19, were convicted of Damilola's manslaughter.